Brand new for 2010, less than a minute drive to the sands of Rendezvous Bay, one the island�s premier beaches, lies Songbird Villa. 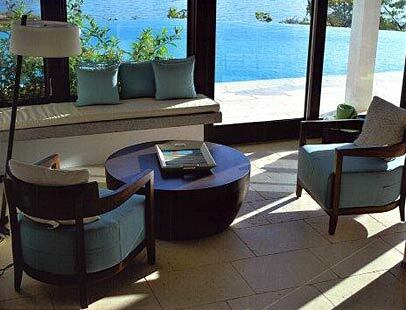 The Architect Lee Skolnick has just completed construction on a 4 bedroom private villa on the Island of Anguilla. The home includes a unique blend of contemporary and classic Caribbean architecture and furnishings but, more importantly, provides a true indoor/outdoor island living experience with tremendous views over Rendezvous Bay beach, the Caribbean Sea and the mountains of St. Martin beyond. The home is outfitted with all modern amenities and fully furnished and decorated to reflect Lee�s great sense of place and style. 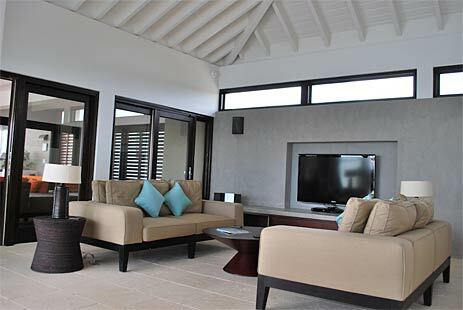 Outfitted with all modern amenities and furnishings, the home combines the best of the natural tranquility of the beach, with the luxury that discerning guests require. 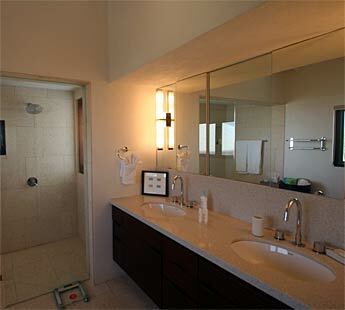 All bedrooms are fully air-conditioned with ensuite baths. The home is less than a minute drive to the sands of Rendezvous Bay, one the island�s premier beaches, allowing you to jump back home to shower, eat or otherwise take a break from your time on the sand. This private gated estate offers relaxed island living. 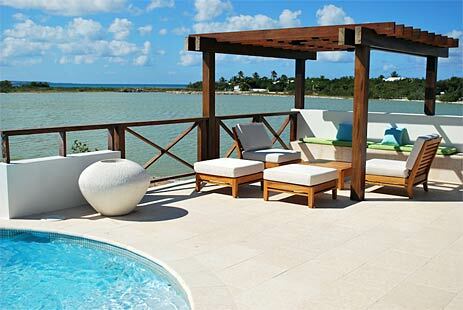 Together with the in-home services to be provided, the rewards of many beach villa vacations await you. A large infinity-edge pool overlooks Rendezvous Bay and the mountains of St Martin while the pool terrace provides several options for lounging by the pool, entertaining or dining under the stars. 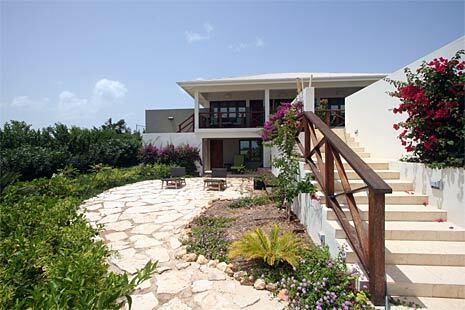 Need more bedrooms, its sister villa Seabird Villa next door offers 4 more bedrooms for larger groups. 2 bedr. 3 bedr. 4 bedr. requires a 10 night minimum stay. Rates and conditions are subject to change. Bedrooms: The villa features four spacious bedrooms, four and a half baths, all offering privacy and comfort. The Master on the East Wing offers gracious living and enjoys its own private balcony, ensuite shower with natural stone tiles and captures magnificent views of the Bay. 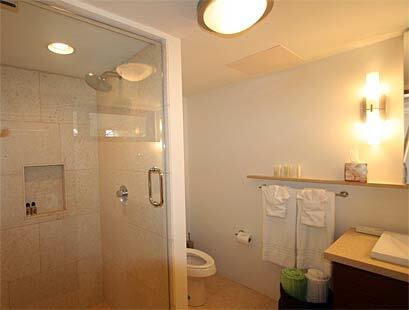 The suite also provides air-conditioning, ceiling fan, state of the art audio system as well as a large flat screen TV. Also on the East Wing there is a separate Study with pull out queen sofa and ensuite shower which can be used to sleep aditional persons. The West Wing (upper level) of the villa hosts two guest bedrooms, one with a Queen Bed and the other with a Full size Bed. Each room has an ensuite shower, air-conditioning, ceiling fans, state of the art audio systems and opens up onto a patio with fantastic views of the sea. 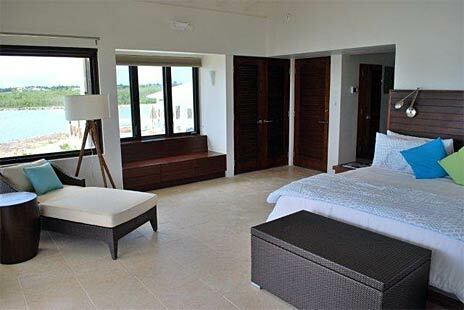 The West Wing (lower level) features an additional Full size bedroom, with ensuite shower, air-conditioning, ceiling fans, state of the art audio system and walkout patio. Enjoy a quiet night under the stars in the outdoor garden sitting area. A laundry room and storage area completes this level. We recommend that young children be properly accompanied as all bedrooms open on to decks, which leads to the pool. Living Area: The living area is cool and comfortable with air-conditioning throughout and has a large flat screen TV, state of the art audio and video entertainment systems to enjoy. The expansive sliding glass doors opens up onto the spacious pool deck with loungers and wonderful areas for you to relax, unwind and enjoy the cool breezes from the Bay. You can also enjoy the indoor-outdoor living spaces as you lounge in the quiet of the comfortable screened-in porch. 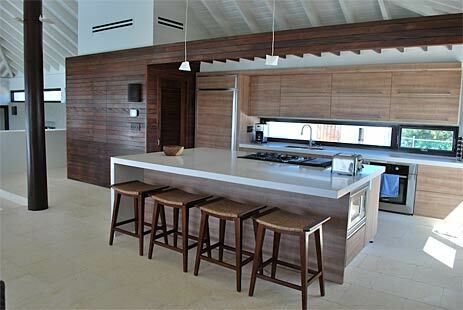 Kitchen: The modern kitchen and cozy living areas immediately welcome you with their Caribbean charm and style. The kitchen is open and complete, with a half bath and a lovely dining area, which opens up through expansive sliding glass doors onto the pool deck, where you can enjoy convenient dining as well. Policies: Reservation and Cancellation Policies: A 50% deposit is required within 7 days of booking to confirm the reservation. The balance is due 60 days prior to arrival. If reservations are made less than 60 days of your arrival date, the total rental amount including tax and service charge is required to confirm your reservation. For Holiday Season reservations (December 20 � January 6), the balance is due by September 15, and are completely non-refundable. Deposits are refundable in full (less 10% administration fee) if written notice of cancellation is received by the Management Company at least 60 days prior to the guests schedule date of arrival. No FUNDS, including deposits, are refundable if notice is received after 60 days prior to arrival. The Management Company reserves the right to cancel the booking if payment is not received by the due date. There will be no refunds made for no-shows, late arrivals, or early departures or weather related problems. We recommend the Renter purchase travel insurance to avoid those unforeseen circumstances. Damage to Accommodation Property: Should the Guest cause any damage to the premises (structure), furniture, fixtures and household items, (aside from normal wear and tear) the Guest agrees to reimburse the Management Company of Rainbow Isle Escapes before leaving at a fair and reasonable price determined by the Management Company/Owners. Any missing household items (i.e. beach towels, room decorations, keys etc.) will also be the responsibility of the rental guest and will be billed upon departure.